As a kid, did you love to take things apart, figure out how they worked, and put them back together again? Do you enjoy solving problems for everyday life challenges, both big and small? Do you have an analytical mind—a mind that enjoys mathematics, puzzles, and the complexities of interlocking parts? 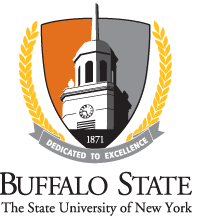 If so, you may be the perfect candidate for Buffalo State College’s Mechanical Engineering Technology Program. Mechanical engineering is the design and manufacturing of machine products—everything from tiny devices like microchips to vast systems like spacecrafts. The best mechanical engineers will be able to visualize and understand how a product will be used; the environmental stresses it will be subjected to, and the reasons people will be convinced to purchase it. Mechanical engineers analyze their work using the principles of motion, energy, and force—ensuring that designs function safely, efficiently, and reliably, all at a competitive cost. Mechanical engineering technology (MET) graduates are in high demand and are employed by manufacturing companies, consulting firms, government agencies, testing laboratories, and other enterprises that require people with strong mechanically oriented backgrounds. The bachelor’s degree in mechanical engineering technology gives students a broad education in the areas of mechanical design, mechanics, stress analysis, thermosciences, and manufacturing. High job placement: Typically, 100 percent of MET graduates will find industry employment within one year. Students with the highest grade point averages usually have multiple job offers before graduating. The SAE Mini Baja Competition is one of the most unique and exciting extracurricular activities open to MET majors. The goal of the competition is to design, build, and race off-road vehicles that can withstand the harshest elements and roughest terrain. The vehicles used in Baja SAE racing are often similar in appearance to dune buggies. Buffalo State’s Mini Baja team is made up of MET students who use the competition as their senior project, which is required for graduation from the program. Mechanical engineering is required for virtually everything that is made, making it one of the broadest and most diverse engineering disciplines. As a mechanical engineer, you may work in the arena of automotives; aircraft and spacecraft; biotechnology like implants and prosthetic devices; computers and electronics; energy conversion devices like wind turbines; environmental control devices like air conditioners; automation and robotics; manufacturing machinery; and pretty much anything else you can think of.